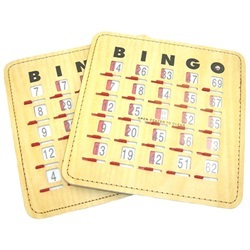 Durable 5 or 6-ply cardboard bingo cards with sliding windows. The 6-ply have a quick clear feature and are slightly more durable than the 5-ply. The 5-ply are a touch less durable for a touch less in cost. 5-ply cardboard bingo card with sliding windows. A Touch less durable than the 6ply for a touch less cost. 5-ply cardboard bingo card with sliding windows. A Touch less durable than the 6ply for a touch less cost. We love to find ways to offer discounts, here's a pack of ten for as much of a discount as we can allow! 5-ply cardboard bingo card with sliding windows. A Touch less durable than the 6ply for a touch less cost. We love to find ways to offer discounts, here's a pack of a hundred for as much of a discount as we can allow! Durable 6-ply cardboard bingo card with sliding windows. This card has a quick clear feature, clearing the free space clears the rest of the card. Durable 6-ply cardboard bingo card with sliding windows. This card has a quick clear feature, clearing the free space clears the rest of the card. We love to find ways to offer discounts, here's a pack of ten for as much of a discount as we can allow! Durable 6-ply cardboard bingo card with sliding windows. This card has a quick clear feature, clearing the free space clears the rest of the card. Now in packs of 100 for a discount!